Hi there, welcome to day one of our JustRite Papercrafts May release! We have a fun release waiting for you, so let me start you with a gorgeous card. Today I am sharing two stamp sets with you. I created a card base out of water color card stock and using different colors I did a color wash. Once it dried, I stamped my sentiment onto it. I die cut a Spellbinders Lovin' Diamonds die out of white card stock and using pop dots I adhered it to the card base. Than came the flower making! 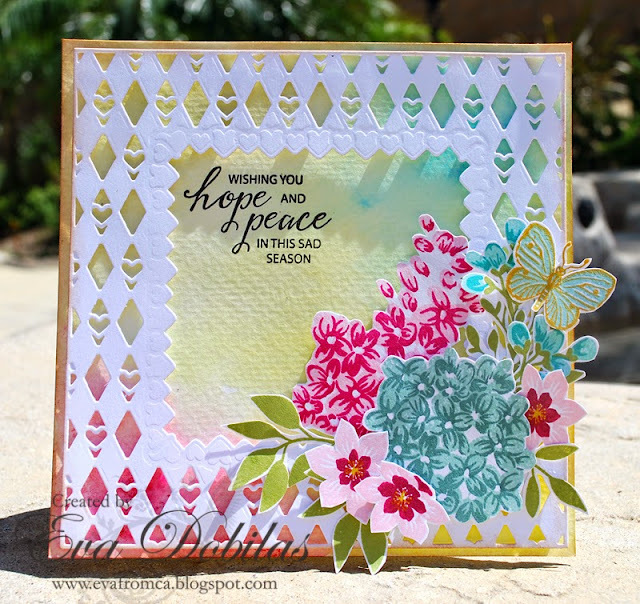 I recently got the MISTI stamp tool, which made stamping these beautiful flowers so easy. So if you have a hard time lining up multi-step stamps, you need to own one of these! Anyway, creating these flowers were easy and I layered them along with the sweet butterfly. Here is what the Multi-Step Lilac Bouquet stamp sets looks like. And here is what the Sympathy Handwritten Sentiments stamp set looks like. And before you leave I want to share about a great sale JustRite Papercrafts is offering that you might want to take advantage of. And how here is the list of blogs you would want to visit today to check out all the gorgeous creations with these beautiful stamp sets! Thanks for stopping by and wishing you a beautiful day!